(Nanowerk News) Researchers at Lehigh University have identified for the first time that a performance gain in the electrical conductivity of random metal nanowire networks can be achieved by slightly restricting nanowire orientation. The most surprising result of the study is that heavily ordered configurations do not outperform configurations with some degree of randomness; randomness in the case of metal nanowire orientations acts to increase conductivity. The study, Conductivity of Nanowire Arrays under Random and Ordered Orientation Configurations, is published in the current issue of Nature's journal Scientific Reports. The research was carried out by Nelson Tansu, Daniel E. '39 and Patricia M. Smith Endowed Chair Professor in Lehigh's Center for Photonics and Nanoelectronics and Department of Electrical and Computer Engineering, and lead author Milind Jagota, a Bethlehem-area high school student. Transparent conductors are needed widely for flat screen displays, touch screens, solar cells, and light-emitting diodes, among many other technologies. Currently, Indium Tin Oxide (ITO) is the most widely used material for transparent conductors due to its high conductivity and high transparency. However, ITO-based technology has several issues. The material is scarce, expensive to manufacture and brittle, a particularly undesirable characteristic for anything being used in this modern age of flexible electronics. Researchers searching for a replacement for ITO are increasingly employing random networks of metal nanowires to match ITO in both transparency and conductivity. Metal nanowire-based technologies display better flexibility and are more compatible with manufacturing processes than ITO films. The technology, however, is still in an early phase of development and performance must be improved. Current research is focused on the effect of rod orientation on conductivity of networks to improve performance. In this work, Lehigh researchers developed a computational model for simulation of metal nanowire networks, which should speed the process towards idealizing the configuration of nanowires. The model predicts existing experimental results and previously published computational results. 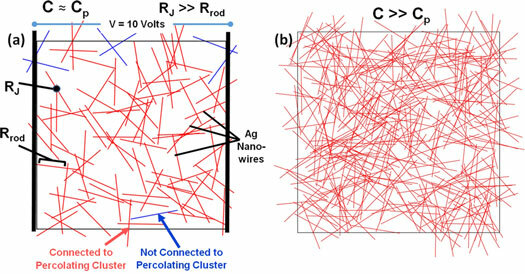 The researchers then used this model to extract results for the first time on how conductivity of random metal nanowire networks is affected by different orientation restrictions of varying randomness. Two different orientation configurations are reported. In the first, a uniform distribution of orientations over the range (-θ, θ) with respect to a horizontal line is used. In the second, a distribution of orientations over the range [-θ] ∪ [θ] is used, also with respect to a horizontal line. In each case θ is gradually decreased from 90° to 0°. Conductivity is measured both in directions parallel and perpendicular to alignment. Researchers found that a significant improvement in conductivity parallel to direction of alignment can be obtained by slightly restricting orientation of the uniform distribution. This improvement, however, comes at the expense of a larger drop in perpendicular conductivity. The general form of these results matches that demonstrated by researchers experimenting with carbon nanotube films. Surprisingly, it was found that the highly ordered second case is unable to outperform isotropic networks for any value of θ; thus demonstrating that continuous orientation configurations with some degree of randomness are preferable to highly ordered configurations. Prior research in this field has studied the effects of orientation on conductivity of 3D carbon nanotube composites, finding that a slight degree of alignment improves conductivity. Computational models have been used to study how percolation probability of 2D random rod dispersions is affected by rod orientation. Others have developed a more sophisticated computational model capable of calculating conductivity of 3D rod dispersions, again finding that a slight degree of axial alignment improves conductivity. "Metal nanowire networks show great potential for application in various forms of technology," said Jagota. "This computational model, which has proven itself accurate through its good fit with previously published data, has demonstrated quantitatively how different orientation configurations can impact conductivity of metal nanowire networks." "Restriction of orientation can improve conductivity in a single direction by significant amounts, which can be relevant in a variety of technologies where current flow is only required in one direction," said Tansu. "Surprisingly, heavily controlled orientation configurations do not exhibit superior conductivity; some degree of randomness in orientation in fact acts to improve conductivity of the networks. This approach may have tremendous impacts on improving current spreading in optoelectronics devices, specifically on deep ultraviolet emitter with poor p-type contact layer."